Master of Dungeons Blog just released a deck of cards based of our ongoing series of Non-Combat Magical Items. The deck is available here at DriveThruRPG. If you want to support Master Of Dungeons, or just want a unique but cheap Christmas present, then I encourage you to check it out. The upcoming item is a more in-depth look at an item available in the deck. 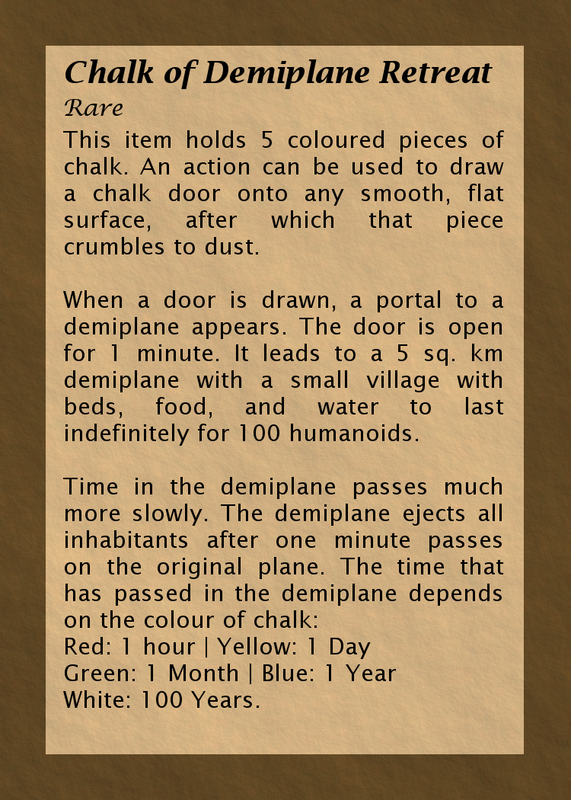 Like all Non-Combat Magical Items on MasterOfDungeons this article should be taken as inspiration, not a rule of law. Non-Combat Magical Items can be used in combat, they just aren't as simple as a +3 sword of cutting stuff. You are the master of your own dungeons and you should modify and change anything to fit your table and your world. You could modify this dagger so that it works only on a specific god or fiend. Or that it contains multiple gems that are the source of its power and each gem must be collected from around the planes. Each god could own their own dagger that can only be used on themselves, and they guard it with all of their power. Always try to modify any RPG ideas you find, it will make you a better Master of Dungeons, as well as make everything better suited for your players. This item appears to be an exotic, gold, gem-encrusted, ceremonial dagger. It is extremely rare, with many religious and magical scholars doubting that it truly exists. 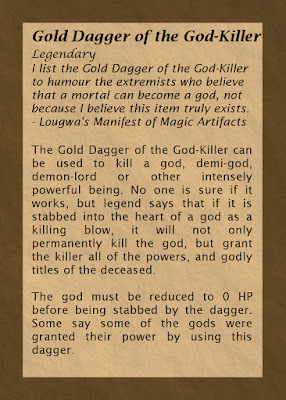 Legends says the dagger can kill a god. Variations of the legends say it can be used not just to kill a god, but a demigod, demon-lord, fiend, titan, ancient, or any incredibly powerful celestial or demonic being. A god who is killed by being stabbed in the heart by this dagger is permanently destroyed, preventing all resurrection and immortality that gods are capable of. 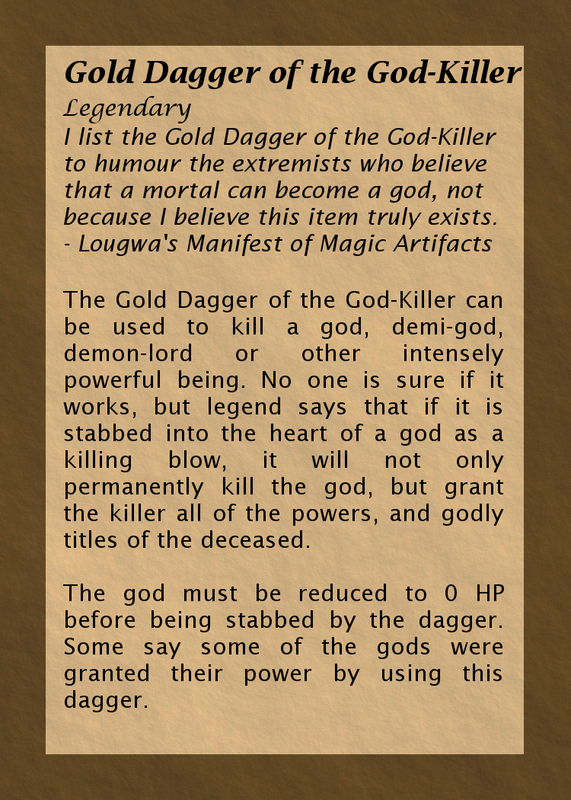 The dagger only works when used on the actual god, and not an avatar or manifestation. 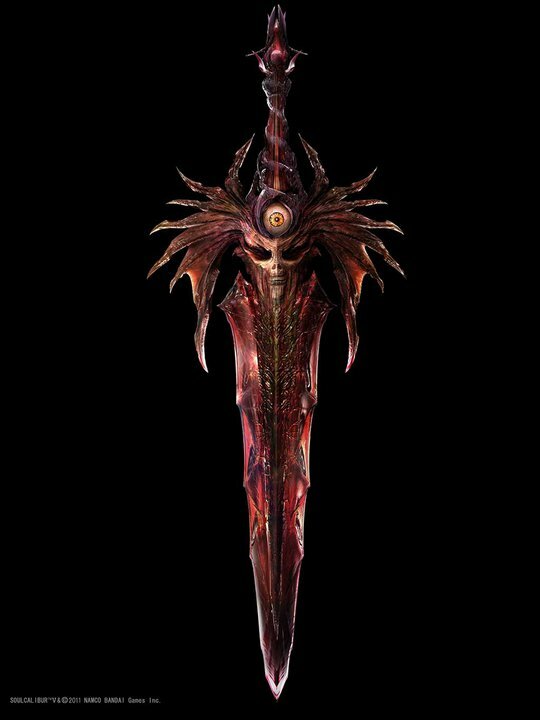 The dagger acts as a channel for the godly powers of the dead god, transferring all powers into the attacker. All planes or realms under the dominion of the dead god are transferred to the attacker, as well as all abilities, and godly titles. The write-up of the Potentially Sentient is obviously far more in-depth than what can fit in the deck on the face of a playing card. 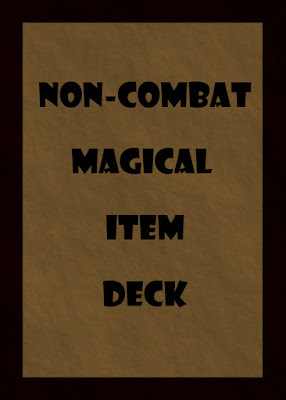 If you pick up the Non-Combat Magical Items Deck from DriveThruRPG (and it would be a fantastic way to support this blog). I recommend that you use the items as a jumping off point. In the last blog post I discussed Flaws and why they are important to characters and character development in RPGs. I then went on to list ten example flaws that you can use on NPCs or Player Characters. As this is a blog tailored more towards DMs, the list wasn't necessarily populated with only flaws that would be a good idea to pick as a player character. A lot of comments seemed to think many of the flaws would be a bad choice for a player to pick, as they can slow down the game or cause major problems. Other comments thought some of them were bad because they were flaws that you wouldn't think would belong to a hero. Flaws that would likely prevent a character from picking up the mantle of a dangerous adventurer. Lastly, others thought that the flaws were fairly generic. This last one I will concede, I hadn't thought very creative flaws would be best for that blog post, but I will try to think of some for this one. It is my opinion that anything that can interrupt a game is more the fault of the player and dungeon master, than that of the character. I will use the Lazy flaw from my last blog post to explain, although I think this applies for any character aspect that doesn't lend itself well to going with the flow of the group and DM. A lazy character might not want to hike ten miles to save the princess, or will insist on sleeping until noon before starting the day's adventuring. This can cause conflict between the characters who want to just get things going, and the players who just want to move the story forwards. Some would argue that a lazy character would cause the game to constantly grind to a halt, as the rest of the players have to convince and motivate them to move forward with the party. I agree that something like this is possible, and maybe even likely, depending on the skill of the player. However, a skilled player knows when to throw a fuss for role-playing purposes, and when to move the game forward. A skilled Master of Dungeons knows when to let a conflict take place, and where to insert a hand-waved time-lapse, that allows the characters to stay true to themselves, while keeping the game fun. Skilled players and DMs still need to control the game to ensure that it doesn't turn into "convince Player 3 to join the game simulator", but it isn't as hard as you might think, and can be easily accomplished with some Out-of-Character communication. Characters that slow the progress of the party can be a source of story and role-playing opportunity, not just a hindrance. Someone who sleeps late may cause the party to miss the last passenger barge out of a port, causing them to pay a seedy smuggler to transport them. A character that complains about a long travel might find himself left alone in the comfortable tavern, that suddenly seems less of a welcoming, safe environment now that he is all alone with bags full of treasure. Flaws that Create a "Bad Hero"
Some readers after the last post made an argument that was close to: "Why would a character with Flaw x become a hero?" This applied to a few of the flaws, but was most relevant to the Easily Scared flaw. Heroes are impossibly powerful beings who travel the world going on adventures and saving the world, why would a coward become such a thing, when the life of a farmer or butler would be so much better suited to them? Luckily, we can turn to fiction to find all sorts of Unlikely Heroes. Dungeons and dragons is largely based on the work of Tolkien, so I think a great example would be Bilbo Baggins. Bilbo was easily scared by many of the monsters and situations he encountered on his adventure, but he kept going and adventuring. By the end of his adventure he was quite the hero, and no one would have expected it at the beginning. He was no Conan the Barbarian, but the entire story is set up to show the reader that heroes can come from even the most unlikely of people. No one is saying that players should create a character that runs from every single encounter and never participates in the game. Even incredibly scared people realize when it is important to fight. The players, as well as the Dungeon Master can move the story forward and create real drama around a character that isn't particularly well-suited for the life of a hero. I'm tired of seeing the same Drizzt clones in all of my games. Create a character that isn't very impressive and see where the story goes. It might be a little bit of work, and might be different from what you're used to, but I think the rewards will greatly make up for it. Of course you may still disagree with me, please leave a comment on Facebook, Twitter, and Google Plus, telling me how wrong I am (or how right), or leave a comment on Reddit. Doesn't believe in magic - This skeptic knows that there are hucksters around every corner, and has learned not to believe their eyes. Never believing that any of the magic they see around them is anything more than a clever trick. Multiple Personality Disorder - Through a magical accident they have absorbed one or more other consciousnesses into their own. They find it very difficult to make a decision, or to relate to people. Some personalities may or may not remember what the others experience. Literal - They come from a culture with no metaphors. They take everything anyone says at face value, having a very difficult time understanding hyperbole and metaphor. Superstitious - This character has a plethora of rules to follow to prevent bad luck. Always knock three times on your helmet before a fight or the enemy will do it with their weapon, stab each fallen enemy in the throat after a battle where you've sustained damage or the wound won't heal, don't step on a crack or you'll break your mothers back. Master of Dungeons has recently put out a deck of cards containing 32 Non-Combat Magical Items, inspired by the ten or so that have been posted on this blog. 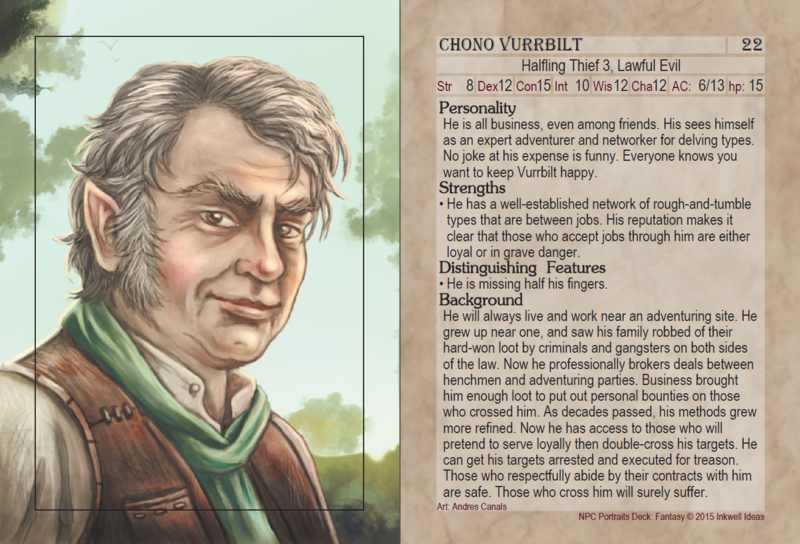 They are available here at DriveThruRPG. They are on sale for $5.99 for one more day and it would go a long way to supporting an independent blog. I'll be able to create much more content if I can raise some funds from this, maybe even hire an artist. Master of Dungeons Blog just released a deck of cards based of our ongoing series of Non-Combat Magical Items. The deck is available here at DriveThruRPG. It is currently on sale for $5.99, but only for a few more days before it goes up to $7.98. If you want to support Master Of Dungeons, or just want a unique but cheap Christmas present, then I encourage you to check it out. Flaws are what make any role-playing character unique. Players and NPCs can and should both have flaws. No one is perfect (unless you're making a Mary-Sue), and that is why I think all characters should be created with a flaw. Flaws give your character depth, and prevent only min-maxing. If real people have flaws shouldn't your characters? Some flaws are better than others, if you want a very severe flaw you could try something like playing a blind character, who has heightened sense of smell and hearing, but would be disadvantaged at many types of dexterity check. Perhaps an amputee who can move slowly and easily get knocked down. Flaws create great role-playing opportunities, and while they don't usually make your character stronger, they can make the game more interesting and your characters more real. Racist - Against any particular race (dwarves, elves, humans, half-breeds), or all other races. Alcoholic - Can't stop himself when it comes to drinking. Skill checks and saving throws may become disadvantaged, not to mention any embarrassing situations they are placed in. Shy - Can't talk to strangers, may start to stammer or go silent entirely. Alternatively the character might be shy just towards a specific gender. Cultist - A member of an obscure cult, with many practices and beliefs that may be abhorrent to the average person. Easily Scared - New things easily scare this character. They like their normal routine, and anything out of the ordinary can send them running for the hills. Bleeding Heart - A kind soul is usually a positive characteristic, but in some people it's over-the-top. This character has to stop and help anyone in need, making it incredibly difficult to accomplish anything. The most minor problems with even the least empathetic stranger can cause this character to drop everything to help them out. Hypochondriac - Adventuring can be a dangerous life, but usually not for the reasons this character thinks. Hypochondriacs rush to the nearest doctor or cleric with every minor scratch and bruise. Even a slightly rude look from an old woman will leave them believing they been cursed. Lazy - This character is completely content to stay in the castle or caravan. It is hard to convince them to get their armour on and start adventuring. Doesn't Speak Common - Many adventurers have a knack for picking up languages, but not always. This character doesn't speak common, and most likely only speaks the language they were born speaking. Communication will be very difficult. Greedy - This character can never have enough money. Everything that they can get their hands on has value to them, and it is difficult to get them to spend even the most modest amount of it. Let us know what flaws you can think of as a comment on Facebook, Twitter, and Google Plus. Master of Dungeons Blog just released a deck of cards based of our ongoing series of Non-Combat Magical Items. The deck is available here at DriveThruRPG. It is currently on sale for $5.99. If you want to support Master Of Dungeons, or just want a unique but cheap Christmas present, then I encourage you to check it out. The upcoming item is a more in-depth look at an item available in the deck. 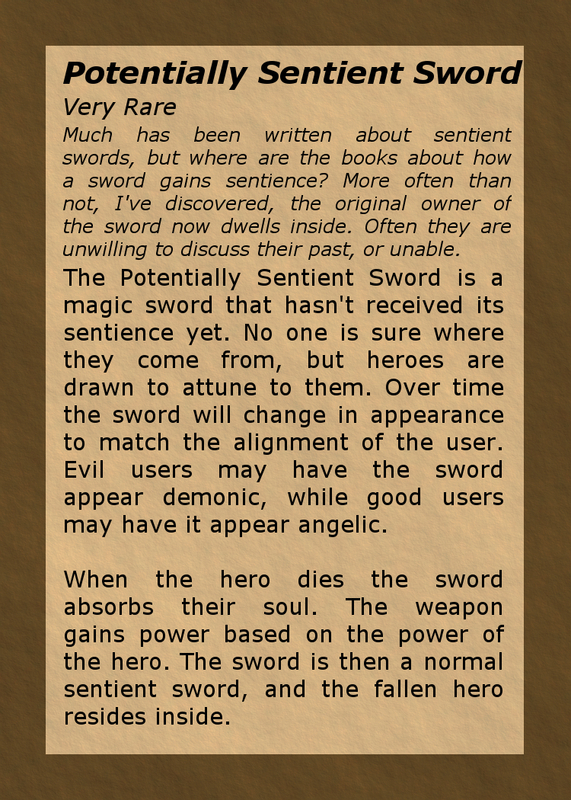 Much has been written on sentient swords, their personalities, strengths, and faults. But where do these independently-minded weapons come from? 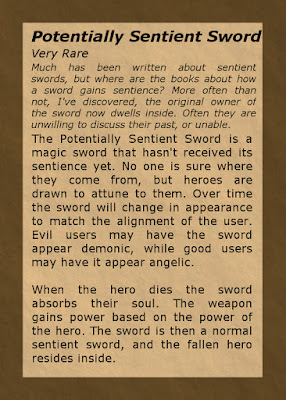 While there are certainly multiple reasons why a weapon might become sentient, the recently discovered Potentially Sentient Sword is likely one of the more common ones. When an adventurer attunes to a Potentially Sentient Sword, it doesn't yet contain a mind of its own. Over (hopefully) years of use, the sword will bond with the adventurer, copying the energies and patterns of the soul. As the hero grows in power, the sword too can become more powerful, fearing being replaced, the sword might destroy a more powerful sword, gaining its strength. The sword will change in appearance to match the personality and alignment of its owner the longer it is carried. A good person may have the sword change to radiant and angelic, while an evil person may have the sword become demonic in appearance. This is an oversimplification, as other aspects of a person's personality can be reflected as well. A greedy, fancy carrier may wake up to find their sword covered in gold and gems, a musician may find the sword has sprouted lute-like strings. When the carrier dies, the final aspects of the person's soul are copied to the sword. The weapon becomes sentient, with the personality and mind of its former owner. Some may despair upon waking after death and finding themselves as an inanimate object, while others may rejoice at the chance to spend eternity in battle, or defending their descendants. The write-up of the Potentially Sentient is obviously far more in-depth than what can fit in the deck on the face of a playing card. If you pick up the Non-Combat Magical Items Deck from DriveThruRPG (and I would very much like you to). I recommend that you use the items as a jumping off point. For example, for this item you may want to think about whether a person can be raised from the dead after being transferred into the sword, whether they are trapped in there, or if it is a duplicate. Hello all, it has been a while since the last blog post. I've gotten married, gone on a honeymoon and dealt with real estate agents and lawyers to buy a house. I should have had more blog posts in the bank to post the past few weeks but I hope to be back now. To celebrate the return of normal blog-posting (hopefully) of Master Of Dungeons blog, we have released our first commercial product. This product is somewhat of a test. There is no money in the Master Of Dungeons coffers, so there is no fancy artwork to speak of. However we believe that this product will improve your time at your table, regardless of what edition or game that you play. After reviewing the fantastic Encounter Decks 3 we realized the benefit of using physical printed cards at the table. They don't take up very much space, are easily shuffled and randomized, and they can be split up easily, even given to a player as a handout if necessary. Master of Dungeons has had the ongoing series called Non-Combat Magical Items since our inception. For those of you unfamiliar with the blog, or those who need an update, we define non-combat magical items as items that aren't specifically created with combat in mind. Non-combat magical items can be used in combat by a crafty player, anything can be turned into a makeshift weapon and these are no different. The DM shouldn't limit the creativity of the players. Non-combat magical items however, are not typically weapons or armour, so they don't have stats for damage or armour. If this becomes necessary in some way a DM should be able to figure out what to give it. In 5th edition Dungeons and Dragons, the introduction of "bounded accuracy" means that players shouldn't be given loads and loads of +3 weapons and armour. Otherwise, they may become incredibly overpowered. It still seems like most blogs and even the Dungeon Master's Guide itself focus on weapons and armour. Players still thirst for magical items, but that doesn't mean we should overpower our players, what we need is a new class of weapon: Non-Combat Magical Items. Now that you've been primed on what Non-Combat means here at Master of Dungeons, lets get to the cards. 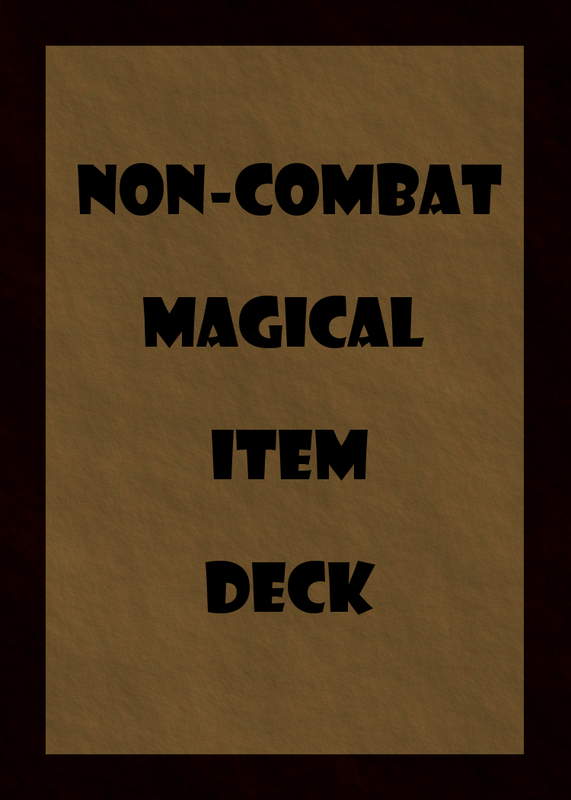 The product, Non-Combat Magical Items Deck contains 32 different Non-Combat magical items. A huge increase over the 10 or so that have been posted on this blog. Since the items are contained in a physical deck of cards, they can easily be given to a player when they receive the item, allowing easier item management. They can be shuffled instead of using a roll table, and they can be mixed in with any potential future decks put out by Master of Dungeons (which will only happen if this one is successful). Enough jibber jabber. Lets get to the 4 free cards to give you a taste of the deck. In previous quick tips we've discussed using improv to become a better Master of Dungeons, including how to "Yes, and" your players to help keep things moving. The most important thing about "Yes, and" is the yes, "and" that is where most of the attention is drawn, but in D&D the "and" is equally important. If your players think of a novel plan for sneaking into a castle, one that you didn't anticipate, it is a good idea to go with the flow and not force them to go through the front door like you planned for. However, that doesn't mean everything has to work the way your players plan. going with the castle example, they may become mistaken for servants, and have to finish some cleaning work or be discovered, they may discover the prisoners in the dungeon, etc. Improv means being able to make things up on the fly, and working with your players instead of against them, however if you always let your players get away with their ideas then nothing is difficult, and there are no surprises. As soon as your players start thinking of something let your mind roam free, trying to think of any sort of consequences or twists that could occur. This is quite difficult at first but with practice you'll become very quick with twists and ideas. Your players may have great ideas, but they can't always get what they want, but sometimes they'll find they get what they need. Would you like to support Master of Dungeons? Mesmer's Anti-Teleportation Shield was created by dozens of wizardry grad students funded by Vlad Mesmer, a wealthy Wood Elf caravan owner. Mesmer caravans and shipping fleets provide food, goods, and personal transportation to over three quarters of human cities for thousands of miles. With the increase in popularity of teleportation and planar shifting, monarchs, fascists, elected leaders and the mortal avatars of snake gods that rule the human cities were becoming frustrated with the lack of control they had over who came and went through their borders and cities. What good was a city guard or highway toll booth when every jock with a magic ring or bush wizard could just say an incantation and appear miles away. The risks to national security were great, not to mention losses in tariff revenue. Mesmer was fed up for different reasons than his nation ruling counterparts. Mesmer's bread and butter was long distance caravan transportation of goods for merchants, now more often than not merchants were opting to pay a premium to have a young wizard straight out of college magically transport their goods. They were able to transport instantaneously, with no risk of theft or damage, bypassing all import and export taxes, while often charging less than traditional transport, (which Mesmer accredited to modern Wizard schools lowering the number of mandatory business classes). Mesmer's Anti-Teleportation Shield was pitched as a way to increase tax revenue and national security by increasing control of the borders. An added benefit was that it returned Mesmer's transportation company to the top spot. The device is quite simple, coming in many sizes and price ranges. Shaped like a small pyramid, around five feet squared at the base, the device emits a powerful magic shield, that reaches out in a dome away from the pyramid. Smaller models range about 100 feet from the device, while the largest, most expensive range around 10 miles. The invisible shield prevents all teleportation, planar travel, and communication through the shield. The dome isn't necessarily spherical in shape, reaching quite high into the sky. As an added benefit, (or negative depending on who you are) the shield often interrupts teleportation that is targeted nowhere near the dome, but who's magical energy passes through the dome, as teleportation usually occurs in a straight line between origin and destination. Many teleporters may find themselves severely inconvenienced, expecting to find themselves at the party of the century on the island of Bul'toa, instead materializing in the slums outside the city walls of the Metropolis of the Snake Gods. Some unethical highway brigands have even modified Mesmer's Anti-Teleportation Shields to act as a sort of net, allowing them to easily rob the unsuspecting, and likely wealthy, wizard who is teleporting by. Prices vary for the shields, depending on the size, order quantity, and how much Mesmer's transportation company stands to profit from increased trade. A few days ago Master of Dungeons reviewed the absolutely amazing Encounter Decks 3 by Inkwell Ideas. (Check out the blog post here). If you missed it, the short version is the deck is amazing and everyone should go out and buy it to add to their table. This week I'm reviewing another product by Inkwell Ideas, (clearly they have some smart writers over there). NPC Portraits Deck - Fantasy is another amazing product by Inkwell Ideas. At my table I tend to improvise a lot, but sometime that leaves flat and boring NPCs. These cards are the cure for that. Not only does it include 56 fully-rounded characters, each with their own write up for stats, strengths, personality, quirks, distinguishing features, possessions, background or any collection of things, but it includes a portrait for each character. My players are definitely visual people. Sadly I don't have an artistic bone in my body, and my printer is broken. I always struggle to make the game for visual for them, often giving up entirely. This deck is worth it in my opinion just for the portraits, or the characters. The fact that it includes both makes it a must buy. You obviously don't need to use the stats if you don't want, or you can adjust them to meet your needs, but they seem very well-written from what I've used so far. The pictures themselves have really improved my games so far, helping my players imagine certain NPCs that they are talking to. If you could only afford one of the products by Inkwell Ideas, I would still recommend Encounter Decks 3, it is absolutely amazing. But if you're placing an order with DriveThruRPG and want to minimize your shipping costs per purchase, than I'd suggest tacking on NPC Portraits Deck - Fantasy as well. I've been reading The Colour of Magic from the Discworld series by Terry Pratchett (it's amazing and I highly recommend it). 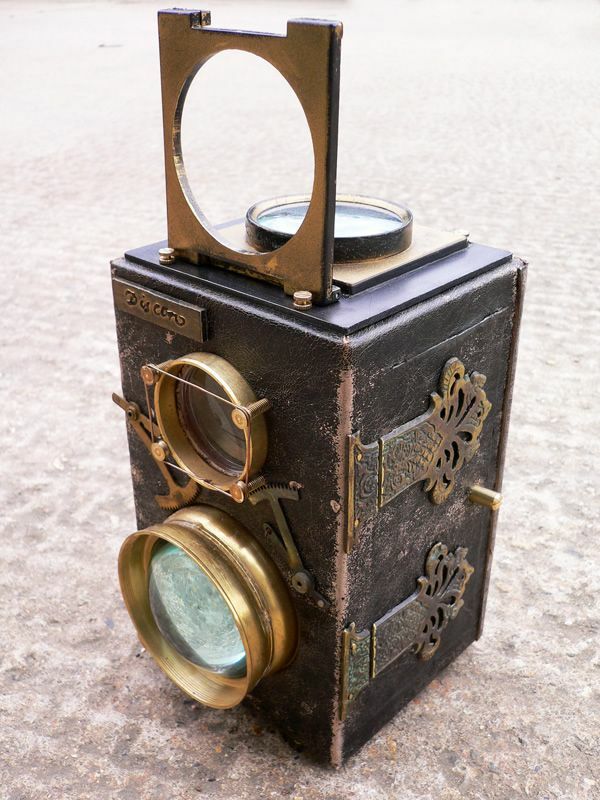 That has inspired today's Non-Combat Magical Item, the Picturebox. The Picturebox is quite an amazing invention. It consists of a small hollow wooden cube, with a glass lense in the front, as well as a viewport for viewing. There is a small door in the back of it. The device is used to create still pictures, in as little as one minute. A small imp is summoned and bound to each picturebox. Only imps of the highest artistic ability are used. The imp lives inside the picturebox, having all of the comforts of home, (stone slab for sleeping, gruel for eating, high-quality canvas and paints). When the user of the picturebox wants to capture a moment for posterity, they simply point the picturebox at the target, being careful to not obstruct the lense and therefore the view of the imp, press the button, and hold the box as steady as they can for one minute. The skilled imp quickly paints a portrait of what he can see, the portrait is of the hyper-realistic style that is popular in the lower planes. Painting imps will only paint what they can see, so they do not take any critiques on style, or attempt anything abstract. The picture is then handed to the user out the back door of the picturebox. The picture is a standard 6-inch square. It is customary, but not required, to give the imp a short coffee break before taking another picture. Today I will be reviewing an adventure from AdventureAWeek.com a subscription service that provides adventures for D&D 3.5 and Pathfinder. The adventure I received was Mini-Dungeon #001 - Buried Council Chambers. I received it through Mythoard, so I won't be commenting on the AdventureAWeek.com subscription model, or anything about their service, although it interested me greatly, perhaps Master Of Dungeons could start some sort of 5th edition subscription dungeon service, if you would be interested in receiving a one page dungeon or adventure every few weeks in the mail as a subscription service, be sure to leave a comment. If you haven't already make sure to check out yesterday's review. The adventure I received came on one piece of high quality glossy paper, double-sided. It is quite a small dungeon, so there isn't too much to talk about. Quite a few decent quality riddles, some puzzles and basic magic items, all of which, although designed for Pathfinder would work with Fifth Edition D&D. There are a few enemies, but again easily adaptable for whatever level players you are using this for. The dungeon map itself is very good, I think the dungeon is worth it just for the map and the riddles. I'm going to keep this tucked away for when I need a last minute dungeon, and the riddles will definitely add a layer of depth to it. The story of the dungeon is good, although short it is all very well-written. 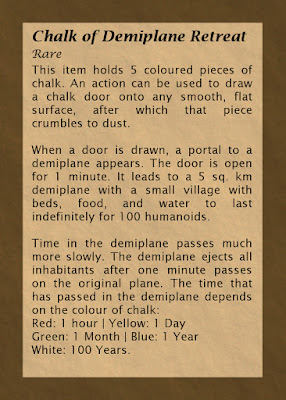 If the quality of all of the AdventureAWeek.com products is as high as this I would definitely recommend it, even for DMs for systems other than Pathfinder, because, this one at least, was very simple to convert to 5th Edition. I'm going to pick a couple more of these up for use when I need a dungeon or adventure last minute. I'm very excited, my Mythoard package finally came! I have a bunch of products to review for the blog. For those of you who don't know, Mythoard is a LootCrate-esque package that comes to your house, the difference being that Mythoard is all related to Tabletop RPGs. This weekend I'll have two reviews, and then some more to come. I will be hopefully reviewing Mythoard itself on another blog as a guest writer, so stay tuned to find a link to that sometime in the coming weeks. Mythoard may be a little pricey, especially if you live outside of the United States, but it really isn't too bad. I didn't realize how excited I would be for it to come. I would highly recommend getting at least one month, even if you don't subscribe, I think you'll like it. (And I don't have any sort of affiliate program with them, I just think it's worth checking out). This adventure is written by James C. Boney of Expeditious Retreat Press. It was written for the OSRIC system, which as I understand means it is essentially written for 1st Edition D&D, old-school RPG, essentially. The rules to OSRIC are available online for free, so if you don't want to buy the rules to a system, and you love that old-school feel, it might be worth looking into. I'm not a huge fan of the old-school RPG, but it seems to be still kickin' around through large movements like OSR. Personally I like the 5th edition of Dungeons and Dragons, it has the simple easy to follow rules of the old-school, while still being a modern system with the newer rules I'm used to. This is likely just a taste thing, and I'm sure I could grow to like the old-school rules. One thing that's important is that I don't know a lot about 1st Edition D&D, or any of the older style of RPGs, so my ignorance will likely show during this review. One of the things I personally find about 80's styled tabletop, is it has a huge portion of the attention on adventuring and fighting. 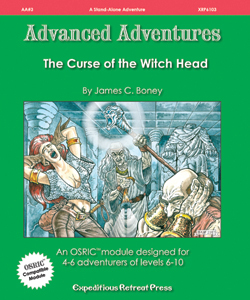 I personally focus more on the roleplaying side at my table, I'm not sure if this is because it is a published adventure focusing on a dungeon, or the old-school style, but The Curse of the Witch Head definitely seems to follow this theme. The introduction brings the players straight into the adventure. There is an evil dude with an evil artifact from long ago, and a ruler who needs help from adventurers. What makes this book different straight off the bat, and I find pretty creative, is that they aren't the first group of adventurers hired for the mission, they're the third. The first two are presumed dead. I'm not a fan of how the book brings in the players, it isn't so much a suggestion as a hand-waving, saying the players were hired for a rescue mission. I know if I asked my players to collect some widget on something that the book describes as what "increasingly seems to be a suicide mission", from a Duke they'd never met, they would run in the opposite direction. The book does do a good job of explaining that anything could be changed by the DM to better suit his needs, so I can't complain too much. Just feels like it is designed as a railroad, but I guess if you didn't want a structured adventure you wouldn't be playing out of the book. Some of the writing seems a little awkward (which readers of this blog will likely be used to). Some of the beginning seems to lack creativity, which make me scratch my head, because as you will see the dungeon itself is quite good. For example, the widget the players are supposed to find is an ancient "Witch Head", it has been hidden away for generations. The location? Witcheed Hill, a hill that the book suggests might have originally come from a slip of the tongue of the original labourers. I found the introduction to this adventure a little lackluster. However, this may be just the style of 1st edition, the Dungeon with a capital D tends to be the focus of these things, doesn't it? The dungeon is very well done, even to a heathen 5e DM like myself. If I had quality dungeons like this in fifth edition modules I would actually run dungeons at my table more often. The map is an old-school white grid on a black background style of map, which I appreciate. I like my maps to be simple. Although the map is simple, the dungeon certainly isn't. Each room as a great two to three paragraph description, with very creative ideas. There is a desecrated temple to a god of good, where the god of evil and god of good are both vying for control, and players have a chance for a temporary boon or curse (rolled on a table), an underground lake filled with giant leeches, and many interesting traps and enemies. The dungeon is far and away the highlight of this module, and takes up the majority of the book. Part of the reason I don't run a lot of dungeons at my table is I use lots of improv, and I'm rarely prepared enough for a dungeon worthy of my players. This dungeon, although designed for another version, is definitely worth running. I definitely plan on adapting this dungeon to fifth edition, mostly by stripping out the monsters and replacing them with 5e monsters. I'm not quite sure what I'll do with the story, but the sense of adventure and exploration that each room of the dungeon exudes definitely makes it worth the attention. While I may not be a huge fan of the old-school RPG, I am a fan of the old-school style of art. Like the old issues of Dragon magazine, the art in this book really stands out. I really appreciate the drawings in this book, especially since the book definitely doesn't need them, it could have made do with just the cover and the map. I'm purposefully not going to review the unique monsters and magical items that were included in this book. I don't think that I'm qualified to comment since I don't have a strong grasp on this ruleset. When I run this dungeon, which I'm now sure that I am going to, I will reflavour the stats of a monster from the Fifth Edition Monster Manual, but describe it to the players the same as in this book, possibly adapting any of the special abilities. Ultimately, I don't think I could become a fan of the OSRIC/1st Edition play-style or rules, but this adventure definitely made me rethink how I look at dungeons, and the general adventuring/exploring play-style. 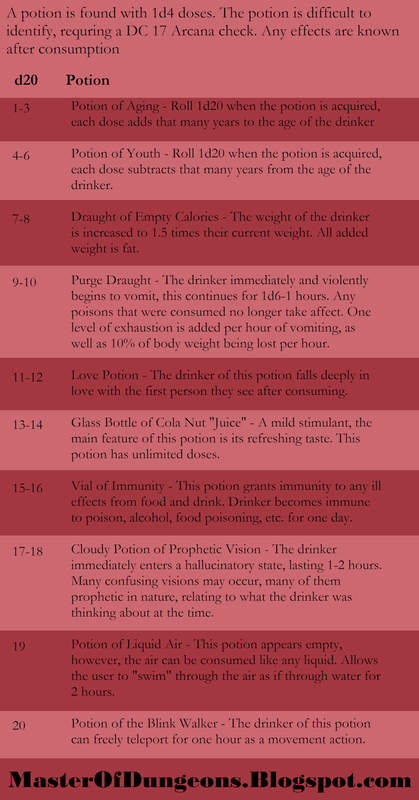 I may be focusing too much on role-play, and need to throw a quality dungeon like this at my players. I would highly recommend picking up this book somewhere like DriveThruRPG, you would be supporting an indie designer, as well as trying things out that might be a little different than you are used to. Even if you aren't interested in the older style (I certainly am not), the dungeon is very well designed, and will definitely interest your players. I suggest picking this module up and plopping in your own monsters from the Monster Manual, you'll have a high quality dungeon ready to go for very little work. Beddel is a stingy dwarf barkeep, who owns and runs the notorious Silver Sidewalk Saloon. The good ol' Three-S is famous for being one of the most tourist-friendly, safe bars and inns in the realm. This is the reputation Beddel has promoted himself, paying for a friendly description from tourism books, and long distance carriage drivers. The truth is much different than the propaganda that Beddel pays for, there is likely no place in the realm where tourists are more likely to get robbed, or worse. Where most dwarves are known for their dedication and hardwork, Beddel is interested in only one thing, money, especially money parted easily from another. He is one of the most skilled con men, always quick with a smile and a reassuring slap on the back, while his other hand is picking your pocket. His favourite target is new adventurers, often travelling for their first time away from their small farming village, with little knowledge of the value of money. The price of ale, or a night's rest can fluctuate from as low as triple the market value, to as high as a fist full of gems of which a naive adventurer didn't understand their true value. Pick-pocketing is a common occurrence in his bar, but the real danger is the ladies in his employ. If Beddel fails at removing all of the valuables he desires from a customer, or if he is worried that they will become too talkey, ruining the esteemed reputation of his establishment, he will send up one of his ladies of the evening to pay the customer a visit. These ladies are said to be incredibly beautiful, but none who have been paid a visit from them have ever been heard from again to verify. As always feel free to contact or follow Master of Dungeons at Google Plus, Facebook, and Twitter or email at MasterODungeons@gmail.com. If you'd like to Support Master Of Dungeons blog, consider purchasing something from Amazon from the links below. Welcome to the first real section of the Wizard's tower, the first ongoing adventure by the Master Of Dungeons blog. This adventure will have the players scaling a large tower, that they first encountered in the introduction (you should check it out if you haven't already). 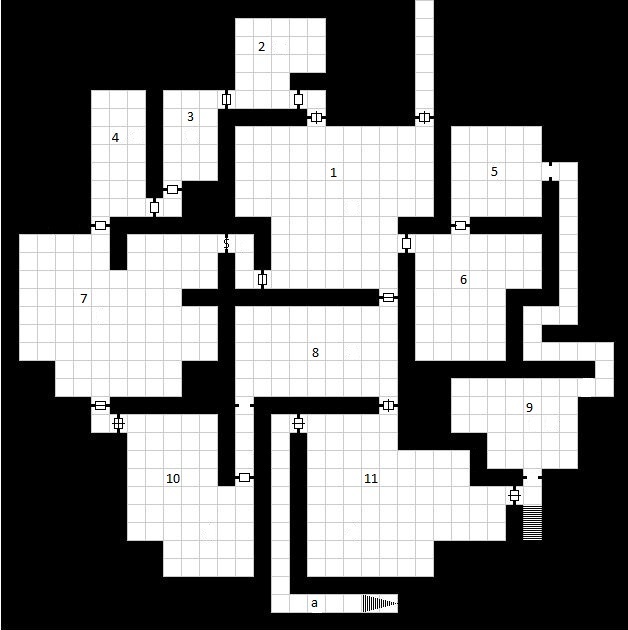 The map was generated using the amazing generator at DonJon. I edited it in paint, took out some rooms and changed the numbers and such around. All of the encounters are original, not the generator however. This adventure is designed for 3-6 Level 1 adventurers, using Dungeons and Dragons Fifth Edition rules, but it could easily be adapted to any system. At the end of this adventure your players will likely be level 2, and if you use milestone achievement you should level them up. 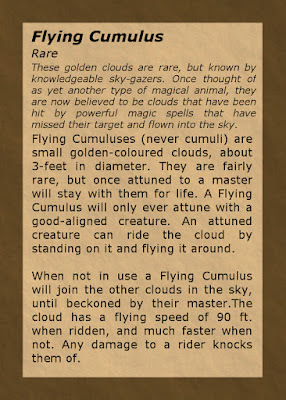 MM stands for Monster Manual, I've included a purchase link here and at the bottom of the page. This room has four hall ways leading off of it, serving as the main hub of the labyrinth of the first floor of the wizard's tower. Two goblins were alerted to guard the door by the goblin carrying the young girl, but if the players take too long then they quickly get bored, going back to their favourite idle-hobbies, nose-picking and attempting to juggle. If they see anyone attempt to enter the room they will attack on sight, saying no one is supposed to be here. Unfortunately for them, neither of them is smart enough to shout for help. This room is kept private with a flimsy lock, from both sides. To pick the lock is a DC 8 Lockpicking check, it is also made of fairly flimsy wood that could be broken down fairly easily. Within the room are 7 small ponies, used for food by the bugbear in Room 3. The ponies are docile, but visibly afraid. If the players free the ponies, two of them will stay in the woods near to the tower, willing to help by carrying supplies or small humanoids. In the corner of the room is a small stage that looks to be built for children's puppet shows. Treasure: 22 sp, 3 gp, polished "Tony" puppet. A large, angry bugbear thinks himself the chef of the first floor, and none of the others are brave enough to suggest otherwise, regardless of the bugbear's lack of culinary ability. He absolutely despises anyone entering his kitchen, anyone except for Tony, his prized possession and best friend. Tony is a small, polished wooden puppet, once a popular toy among noble children in a nearby city. The bugbear somehow found himself with the toy, talking to it as he cooks. He will defend his kitchen violently, but he will defend Tony to the death. 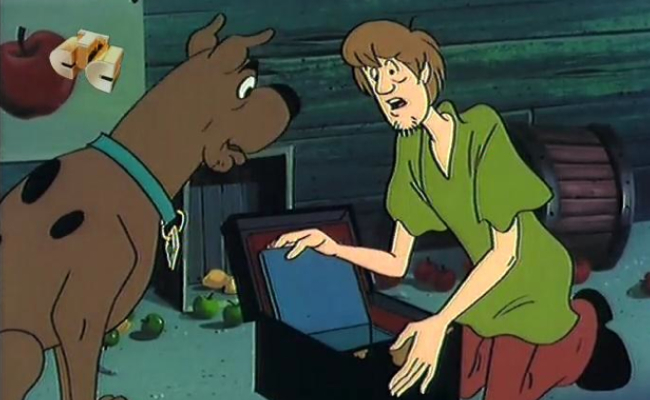 The coins are sitting in a coin purse, next to the puppet. Six drunk goblins are alternating drinking cheap wine and attempting to stomach the chef's mystery meat. The goblins are drunk, so all of their attacks are done with disadvantage, as well, they are so ill-prepared for combat that even if the players walk in and talk to them, they will still be surprised by combat (Missing their first turn). These goblins award half XP (reflected in the totals above), since they are so inept. If he hasn't been dealt with already, after four rounds of combat the bugbear from room 3 enters with a plate of food. If he sees fighting he shouts at the goblins, sobering them up (and removing their drunken disadvantage and returning their XP to normal), before joining the fight. Two goblins and two kobolds lie sleeping in bunk beds, in a row filled with a large number of beds, stacked three high. 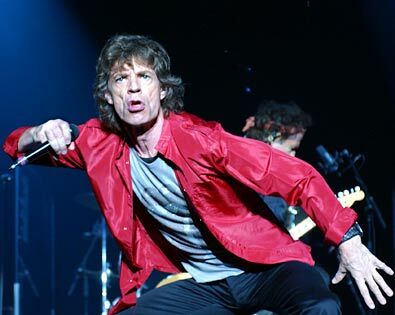 One goblin is sitting awake at a table, sharpening his sword. If the awake goblin notices anything out of the ordinary he shouts the others awake, or if he is killed too loudly. One of the goblins will not wake under any condition. He has a beautiful amulet around his neck. Upon inspection it is noticed that the goblin has none of the normal warts and scrapes that are normal for goblins, and looks incredibly youthful. The amulet falls off the goblin if he is killed, but otherwise will not come off. The amulet is Lessiroth's Amulet of Beauty Sleep, and if it is removed the goblin's body will age into an incredibly old and gray version of his former self. Two hobgoblins are sitting on a moldy looking sofa, arguing about whether little girls can be eaten. They know nothing about any girls brought into the building, other than a goblin named Gripp was seen bringing one into the building, and they weren't allowed to eat her. They don't know why she was brought to the tower, just that she was brought upstairs. The sofa is facing away from the doors, but they eventually notice anyone in the room and, upset at the earlier missed opportunity for a meal, try to kill and eat them. Three skeletons lie around the room. A frightened goblin is tiptoeing around the skeletons, late for dinner in Room 4, when he eventually notices the party (unless they are sneaking). When the goblin notices that players he lets out a blood-curdling scream. The drunk goblins in Room 4 are too preoccupied to notice, however the three skeletons in the room take notice, rising from their rest to attack anyone within reach. The skeletons will attack whoever is closest without discrimination, the goblin included. One of the skeletons has two health potions stuck in his rib cage. This room is coated on every surface: walls, floor, ceiling, and doors with mirrors. Despite the decrepit, old appearance of the rest of the tower, the mirrors in this room are in perfect condition. It is quite disturbing, but doesn't appear to be dangerous. This room is empty. A door in the south side of the room leads to a staircase to the second floor. The door is locked, but the door knob is sentient. The door knob is happy to see some friendly faces, being quite unhappy with the rough sort of creatures who have made this place their home of late. He isn't very knowledgeable about the tower, saying that "Nobody ever explains what's going on to the door knob", although he did notice a crying girl carried by a goblin go up the stairs. He would definitely like to help the adventurers to save the girl, but he can't open unless they have the key. He says there are a few keys carried by different dangerous looking people, but he knows that a map exists to a backup key in the map room on the west side of the building. Treasure: Map to the Backup Key to the second floor. A bugbear is looking through the many piles of maps in this room, giggling to himself. The bugbear likes to come in here while others are busy to pretend to be an adventurer in a faraway land. He gets embarrassed if watched, and tries to kill any witnesses. In the center of the room is a large map with the title IN CASE 2ND FLOOR KEY IS LOST. The library somehow seems unappealing to the residents of this floor. The room is filled with a thick layer of dust. Some of the books appear to have bite marks in them. If the books are flipped through for any amount of time, it is likely the players will notice two spell scrolls (listed above), stuck in one of the books. This long winding staircase is locked off by the door to Room 11. The door is locked shut with powerful magic, not opening for anyone without the proper magic key (To make an appearance in a future adventure). The next section of this adventure is up to you. The players need to follow the map to get the key to the second floor. It should be guarded by some monster or enemy, but whoever has it doesn't know what they have. The players should be level 3 before returning to the tower. The Dungeon Master's Guide can help you with creating encounters and daily XP schedules. Make sure to pick up the Monster Manual if you haven't already, and each of your players should have their own Player's Handbook. (Plus if you follow these links you'll help support Master Of Dungeons. Next you should follow Master Of Dungeons on social media (Google Plus, Facebook, and Twitter) to make sure you don't miss the next installment of the Wizard's Tower. This week I tried to make a critical fumble roll table, but I got bored. There are tons of good examples out there, so just google it. Here is this week's roll table. If you want to become a true Master of Dungeons, you have to learn the true meaning of improv. This isn't something I see talked about very often, but D&D (or RPGs in general) is essentially a form of improvisation. That means that becoming a better DM relies on mastering the most important rule of improv, Yes and. "Yes and" means trying to always move the story along by taking your co-improvisers suggestions, agreeing with them, and adding something. Obviously if your players try something impossible, or ridiculous, that doesn't mean you have to completely agree with it, but you can at least attempt to not give a hard no. DM: You're trapped in a cell, there is a snoozing guard by the door. Player: Is the window barred? Are there any secret tunnels or anything like that? DM: (There hadn't been any tunnels in your notes) Yes, underneath the window there is a loose tile that turns out to be a tunnel. Player: They may know the tunnel is there, it might be booby trapped. Are there any noticeable traps? DM: Roll an investigation check... You find a small dart trap that looks like it would have been triggered by a floor tile. You can easily step around it. Now you don't want to do this for every idea the players say. Sometimes there just isn't a secret passage, or a trap. Otherwise they'll realize that they can dictate the game by thinking of easy shortcuts. Its also important to keep the players surprised, don't simply add things to your world because they asked if they are there. Your city probably has improv classes, it might be interesting to try one out. You'll have fun, and become an even better Master of Dungeons. The Mirror of Shan'ful was created by a cult of warrior priestesses in the age of the goddess. Their leader, Shan'ful, was believed to be the living embodiment of femininity. The cult was unyielding in their belief that men were inferior to women, and that Shan'ful should rule all of the inferior cities of men. The cultists were conquer a city, and place Shan'ful on the throne. However, a problem arose as their conquests grew, Shan'ful was their ruler but also their most powerful warrior. It was impossible for her to asset her rule in all of the cities as well as be present on the front line of her war party. One year the spring equinox landed on a full moon, an exceptionally holy day to Shan'ful's cult. Aided by the increase in her power, Shan'ful created a large circular mirror, the Mirror of Shan'ful. She placed this mirror behind the throne of her largest city. The mirror allowed her to create an avatar, sitting directly in front of the mirror, so that she may rule from the battle lines. Every full moon, another mirror could be pulled from the Mirror of Shan'ful, an exact duplicate, attuned to her in the same way as the original. In this way she obtained more mirrors to place in her capitals. The avatars were unable to leave the vicinity of the mirror, but her subjects did not know that. They lacked all of her power, but were completely controlled by her. She could speak from each avatar independently, meaning she could be in the depths of combat in her primary form, while enacting a law in one city, and sending a prisoner to the gallows in another. Unfortunately the cultists eventually spread their armies too thin, a neighboring colony of dwarves tunneled into her capitals and usurped her thrones. She was slain in the final battle, all of her duplicate mirrors disappeared, although some say her soul still exists within the original Mirror of Shan'ful. The Mirror of Shan'ful is a one-of-a-kind magic item. When someone attunes to it they may pull duplicates out of the mirror on the full moon. All avatars are controlled by the character, but concentration is unnecessary. Each avatar is as easy to control as a limb. All knowledge is shared between the avatars and the original. Some say the soul of Shan'ful still exists within the mirror, she despises the concept of a man using her mirror, and may attempt to seek control of the avatars. This is a secret Wisdom saving throw of DC 5x, (where x is the number of mirrors currently in use) that occurs on each full moon. If the saving throw is failed, Shan'ful takes control of one avatar (the newest created), she attempts to secretly use the rule of the avatar to obtain the other mirrors and capture the user. If one mirror is controlled by Shan'ful then the saving throw is done at a disadvantage. If the original mirror is controlled by Shan'ful, (meaning all of the mirrors have been taken over) she returns to life, and the original user must pass a DC 15 wisdom saving throw or become possessed by Shan'ful. The Mirror of Shan'ful may be used to run a shop or a store, rule a kingdom or city, maintain a presence at a guildhall, or many other things. The soul of Shan'ful's presence in the mirror is optional, at DMs discretion, and the players shouldn't know about it, unless they hear rumours of the history of the mirror. If the full moon were to land on the Spring Equinox while the mirror is in use, then that may trigger Shan'ful to attempt to take over the mirrors. If you haven't already make sure to follow Master Of Dungeons blog on all of the relevant social media (Google Plus, Facebook, and Twitter), where I post all updates to the blog, as well as interesting things I find around the internet related to D&D and RPGs. I am also looking to get in touch with an artist who reads this blog to discuss some artwork to be done and possibly some sort of partnership. More details here. So since my orders that I've been hoping to review for over a month still haven't come, I don't any fun Sunday reviews for you this week. I'm hoping there will be something soon. So this Sunday we will just be sort of taking off, if that is alright with you. However there are two things I'd like to get in touch with any readers of this blog over. I'm looking for an artist to partner with on this blog. I have no money to pay you (I have done nothing but lose money on this blog so far). However I will credit all of the work you do, and someday when if this blog makes any money, we will work out some profit sharing arrangement. This is the first time I've mentioned it on the blog, but one of my ultimate goals with this blog is to eventually create material, and/or interested consumers, for a D&D or system agnostic supplement book. 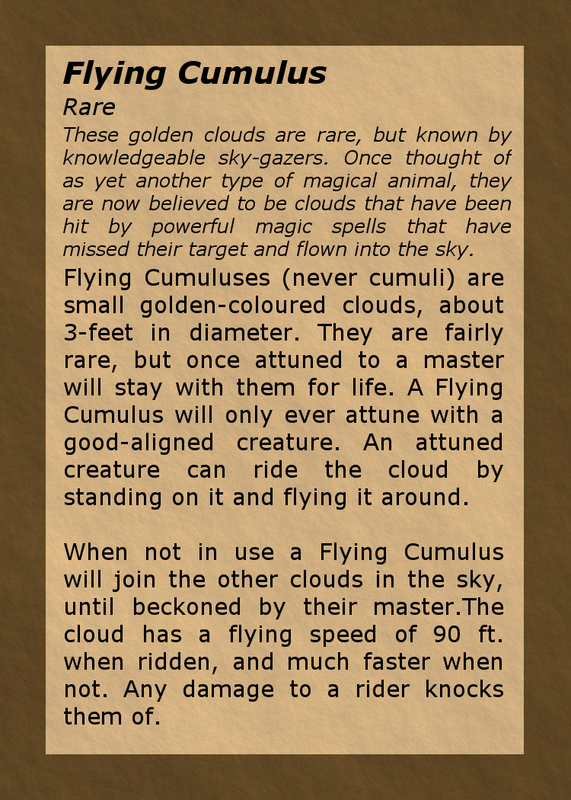 My dream would be to create a book of Non-Combat Magical Items (with some roll tables thrown in), since those are my favourite things to make. Just like the old book of Marvelous Magic That would all need art though, and not the horrible pictures I steal from Google Images, but actual art. If you're interested, or know someone who might be, contact me at either one of the blog's social media accounts (Google Plus, Facebook, and Twitter) or email me directly at MasterODungeons@Gmail.com. Hell, I'll even let any of you email me or contact me on social media, I won't mind I promise. I would also like to get some advice from someone with more experience blogging. I'm beginning to grow weary of the Blogger/Blogspot experience. I could get my own domain but I'm wondering how the transition would be, or the transition to a wordpress blog on my own domain. If anyone has experience with this, or just experience on the technical sides of running a blog, I'd love to hear from you. (I'm fairly technical as I'm a computer programmer by trade, so I'm sure I'll figure it out easily enough). Again feel free to contact me at one of the blog's social media accounts (Google Plus, Facebook, and Twitter) or email me directly at MasterODungeons@Gmail.com. The first two Master of Dungeons articles on online tools were incredibly popular, so here is number three. All of these tools are ones that I use personally, and think are really bitchin'. You should also check out the first and second blog posts if you haven't already. Now on with the show! This generator is super awesome. Simply enter the number of rooms you need, and the generator spits out a basic description of each room. If you play dungeons like I do, you may not require a full drawing of the room, or you may have a map but need something interesting to happen in an empty room to keep your players interested. You could also run it with 8,12,20, or 100 rooms and use it as a roll table. Enworld has two good 5e NPC generators that I use when I need to have some quick NPCS but don't feel like being creative. (You should really never have this problem, since you can check out the Friday NPC of the week here are Master of Dungeons, like Brother Tiggin). I still find them useful when players delve deeper into the history of a random NPC than I expected, or start asking a lot of questions about the faceless, nameless innkeeper. 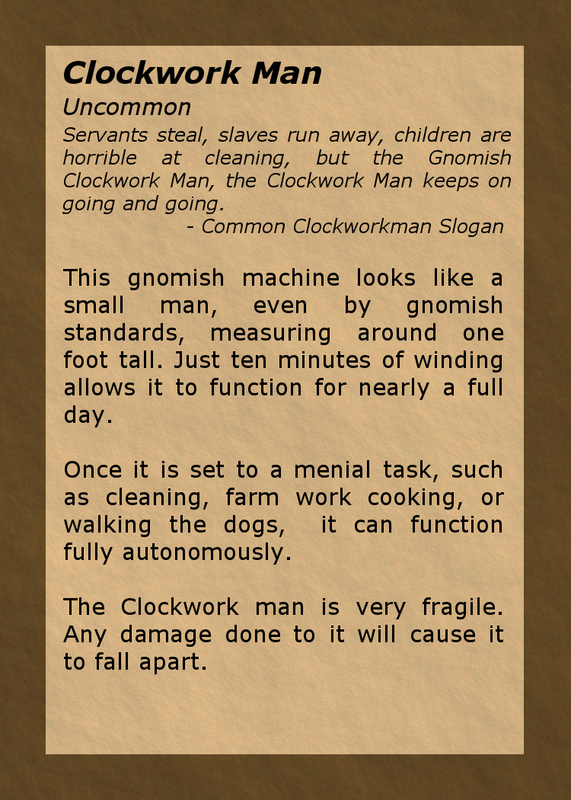 There are two generators, the first (which you can find HERE) is more basic, showing a basic one line description of your NPC. This would also be a good generator to use if you needed an idea of what kind of character to build. 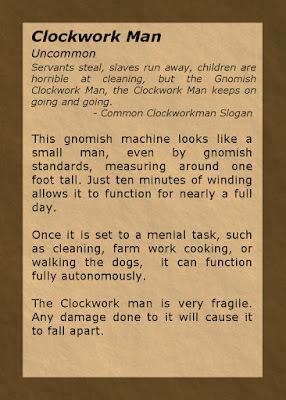 The other generator (found HERE) provides the same information as the last one, but then goes further and gives a little more detail about the personality and history of the character. This can be great for inspiration, although is a tad formulaic. This tool (available HERE) I personally use all of the time. It contains an adventurers league legal full character for each class type (including subclasses) for each level! 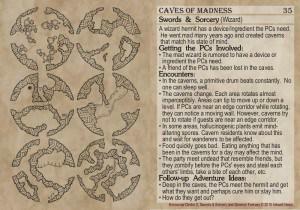 Each level from 1-20 contains a perfect character sheet for you to bring to a last minute game. I carry around dozens of these in my D&D box so that if anyone wants to join a game last minute, or there is any chance of an impromptu game, I can let someone pick a character without having to build one from scratch. Its amazing that these characters are at any level, and every class type. That means that you don't have to start every game at level 1 if you don't want to, if you have someone who wants to try out D&D just for one night, why not work them into your game with a new character? The only flaw I could possibly think of is that the race of the character might not match up with what you want to play, (For example, I personally hate the dragonborn race and don't tend to allow it in my games, but some of the classes are only built as a dragonborn.) but this is hardly a major issue, simply remove any race characteristics, and fix the modifiers and you have a perfect character of a different race.